Late on 25 March, the last Ukrainian warship blockaded in its port on Crimea's west coast surrendered to Russian forces, completing just over three weeks of operations to wrest the strategic peninsula from Kiev's control. This whirlwind campaign seems to herald a new sophistication in how Russian commanders conduct military operations. The most distinctive feature of the Russian operation was its emphasis on economy of effort. Unlike previous interventions in Afghanistan in the Soviet era, or Chechnya and Georgia more recently, where Russian commanders relied on mass employment of tanks and artillery, the Crimea intervention featured fewer than 10,000 assault troops lined up against 16,000 Ukrainian military personnel. The heaviest fighting vehicle employed by the Russians against the Ukrainians was the wheeled BTR-80 armoured personnel carrier (APC). Once Russian troops had moved to blockade Ukrainian military personnel in their bases, psychological warfare, internet/media propaganda, intimidation, and bribery were their main weapons to undermine their opponents' will to resist, rather than overwhelming firepower. Russian troops also displayed considerably discipline and patience during this phase. In addition, they appeared well equipped, boasting new personnel equipment, body armour, and light wheeled armoured vehicles. This novel approach was necessitated by Russian President Vladimir Putin's need for the operation to be launched within a tight timeframe after the fall of the pro-Moscow regime in Kiev on 27 February. Although the operation may have been planned for many months, there was insufficient time to mobilise a larger force. 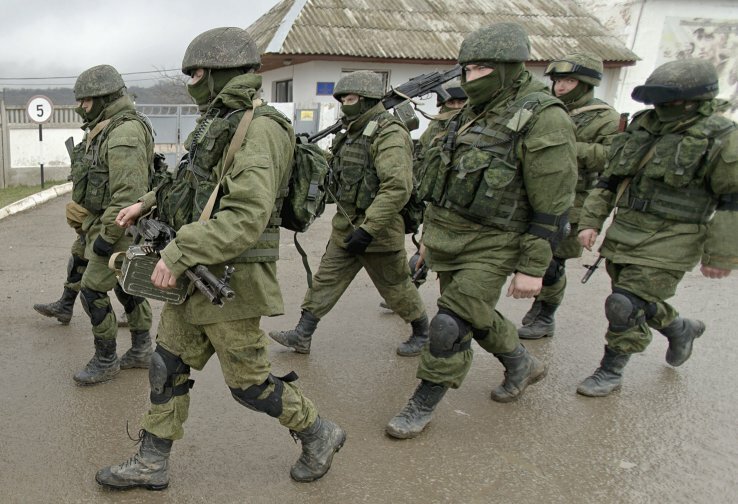 Russian commanders had to make do with naval infantry from the Black Sea Fleet already based in Crimea, backed up by a couple of battalions of airborne troops and Spetsnaz commandos flown onto the peninsula. Economy of force also fitted the campaign's political narrative: that this was a mission to protect Crimea's Russian-speaking population rather than an invasion. In just over three weeks, the will of the Ukrainian forces in Crimea was broken and all 190 of their bases had surrendered with barely a shot being fired by their defenders. However, even if some Ukrainian heavy armour was present in Crimea, many of the Ukrainian forces were naval and administrative personnel rather than combat troops. Organised military resistance was never a serious prospect. Instead of achieving a simple military triumph on the battlefield, the Russian armed forces facilitated a political and psychological victory. In the wake of his success, there has been intense speculation about President Putin's future intentions. In his 18 March victory speech after the fall of Crimea, he laid out his underlying worldview. Russia's loss of power and status at the end of the Cold War in 1989 was a deliberate, generational humiliation at the hands of the West - and a reason for hatred and apprehension. For the Russian president, Ukraine's strategic importance to Russia is the key issue. In Putin's view, Ukraine is the pivotal connector between East and West. Control of Ukraine means control of the Black Sea and unobstructed access to potentially sympathetic populations in central Europe and the Balkans - in nations such as Bulgaria, Slovakia, and Serbia - and the exercise of time honoured 'pan-slavism' with a view to greater integration. These strategic perspectives appear to have been largely lost to Western leaders. Ukraine is sufficiently important that in 2004, the last time a split from Russian control seemed likely, Viktor Yushchenko, the pro-Western opposition and Orange Revolution leader and later president, was nearly fatally poisoned and permanently disfigured by the use of dioxin. In any case, the Kremlin sees a 'colour revolution', heralding liberal democracy amongst Slavonic people, as threatening and utterly unacceptable. 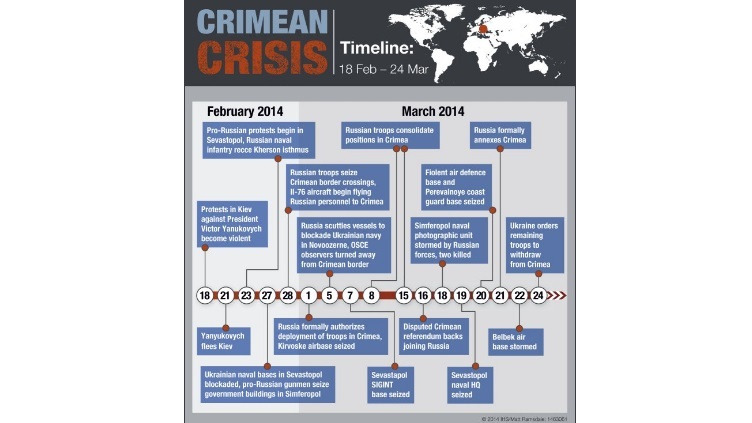 A significant effect of the Crimea campaign has been to further test NATO and EU resolve. Russian leaders tend to think in larger pictures than their Western counterparts. 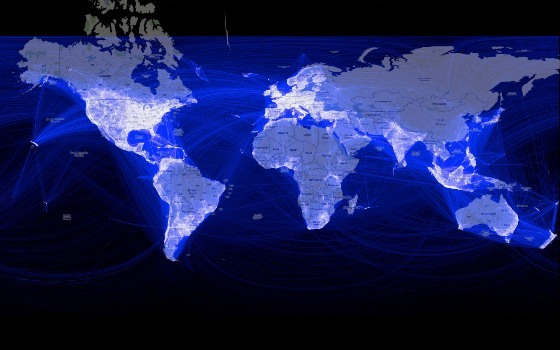 'Atlanticists' are likely to consider individual nations or small groups of countries, threats to them, and their specific importance, without interconnecting them. Russian analysts evaluate - and have whole branches of study devoted to - the Black Sea-Baltic region as a strategic territory and subject in itself. Russia has generally controlled these areas between Russia proper and foreign countries, referred to in a wider context as the 'near abroad'. Speculation has shifted to Moldova - and its adjacent, unrecognised Russian-speaking enclave of Transnistria or the Pridnestrovian Moldavian Republic (PMR) - as the next test of Western resolve in the face of possible intervention by Putin. A potential justification or pretext for a Russian incursion here is the small self-declared republic's wish to become part of Russia and the disputed presence of a battalion of 400 Russian peace-keeping troops. On 25 March, Russia announced the start of territorial defence exercises in Transnistria, which Moldovan sources described to IHS Jane's on the same day as of concern even if anticipated. Although part of NATO and the EU, the Baltic States are the northern end of the Black Sea-Baltic space and are vulnerable. The disapproving tone of some Russian rhetoric suggests they exist under sufferance. From the Russian Air Assault Division base at Pskov near the Latvian-Estonian border, forces could - from a near standing start - cut off Estonia from the rest of the EU in less than 40 minutes, according to a former Russian air assault division commander. The same could be done along the 80 km Polish-Lithuanian border, which runs between Belarus and the Russian Baltic enclave of Kaliningrad. In both cases, one or all the Baltic States could be enclosed, controlled, and separated from the rest of Europe. In the Baltic, eastern Ukraine, and Moldova-Transnistria Russian military units are in place, available for further exploitation if President Putin so desires. This article, first published on 27 March, has been updated with new images. (AGI) Baghdad - Sectarian tension is once more sowing terror and bloodshed in Baghdad. A suicide bomber attacked the offices of the authority that manages Shiite mosques in the neighbourhood of Baab al-Muadham, killing 22 people and injuring over 65. "I know there were weekly meetings dealing with terrorist threats and planning around it, but I did not attend those meetings," Axelrod said on CBS' Face The Nation. "First of all, let me say, Eric Holder is a great friend of mine. Assad says Syria will continue to fight "terrorism"
"We will continue firmly confronting terrorism, leaving the door open for those who want to return," Assad told parliament. "I urge all those who are still hesitant to do so, to take this step. The state will not take revenge. Like Lashkar-e-Taiba, the group that perpetrated the Mumbai terrorist attack in 2008, and the Haqqani Network, which has organized attacks against American forces in Afghanistan, JeM is allowed to do pretty much whatever it wants.